A poor bite (malocclusion) could be more than simply teeth out of alignment. There could be complex causes for the malocclusion, possibly involving the facial bone structure. An example of this is the development of a cross-bite due to problems with the upper jaw and palate (the roof of the mouth), jointly called the maxilla. The maxilla is in fact formed by two bones fused together in the center of the palate in what's called the midline suture. The suture doesn't completely fuse until after puberty. Sometimes a maxilla's development doesn't follow a normal track. The upper jaw doesn't widen as it should, which leads to the cross-bite where the upper back teeth abnormally bite inside the lower teeth. The upper front teeth continue to bite normally in front of the lower front teeth. This also can have profound influence on breathing, causing sleep apnea. We can correct this by using an orthodontic appliance called a palatal expander before the midline suture fuses. The expander gradually widens the upper jaw to its normal width and thus eliminates the cross-bite. Positioned at the roof of the mouth, the expander has metal arms that extend from a central hinge to exert pressure on the inside of the upper teeth. The patient or a caregiver uses a small key to turn a mechanism that extends the arms toward the teeth a tiny amount each day. This gradually widens the jaw, while at the same time stimulating bone growth at the midline suture. Eventually the gap fills with bone to solidify the new width as the suture fuses. It's important to undertake this treatment before fusion. If you wait until after puberty, you will need to separate the bones first to attempt it. The overall impact and cost is much less if you act promptly in the early years. 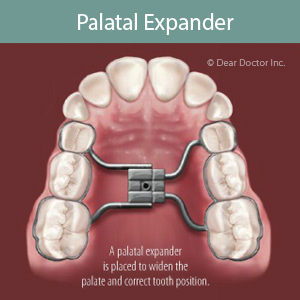 Palatal expansion may not be the right treatment in every case, so we'll need to perform a thorough orthodontic exam first. If, however, we do determine it can help, using an expander can improve function, correct future breathing problems and make possible a more attractive future smile.